Why Should You Choose a Flat Metal Canopy? Keep you flat metal canopy maintained to ensure its longevity for years to come. A flat metal canopy is a popular choice to use for awnings. On your business, you should choose a flat metal canopy. Here at Carroll Awning Company we now offer premium flat metal canopies. Consider getting your flat metal canopy from us, as we also offer manufacture to your specific requests. In this blog we’ll talk about why you should choose a flat metal canopy. We’ve discussed this before, but as always this is more to say. A flat metal canopy is a type of metal awning that has the rare ability to provide an extraordinary curb appeal. With its clean and sleek look, you’ll be sure to draw the eye of new customers and delight old customers alike. 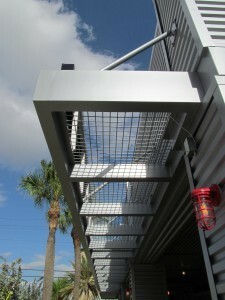 A flat metal canopy can be constructed of many possible materials, such as aluminum. Aluminum is particularly versatile as a canopy material because it can endure the worst nature can throw at it. Heavy rain, heavy snow, or high temperatures are no match for it. Make your business stand out! Your logo and company colors are easy to add as an embellishment. The flourish will make your company memorable, and increasing business is another happy side effect. When a flat metal canopy is installed, it will last. But as durable as it is, metal since needs periodic maintenance. You can either carry out this servicing on a do-it-yourself basis or call in the professionals. Cleaning your canopy will help it regain its shine. You’ll also want to check it hasn’t worn down or become damaged. Even if it can withstand wild weather, you don’t want it to fail. But staying safe is the most important factor in all of this. Having professionals take care of your flat metal canopy for you means you don’t have to put yourself or your business at risk.